Home › Electronics › Iphone Se Case Caseology [Envoy Series] [Genuine Leather] [Leather Cherry Oak..
Iphone Se Case Caseology [Envoy Series] [Genuine Leather] [Leather Cherry Oak..
Genuine Leather: Hand-selected cow leather completely fused to the shock-absorbent TPU provides beauty and protection all in one. Ultimate Class: The smooth, delicately pebbled leather pairs with a gold bumper for a sophisticated aesthetic. Reliable Protection: A shock-absorbent TPU liner paired with a semi-rigid polycarbonate bumper protects your phone from drops. Durable Quality: Leather ages gracefully and resilient TPU withstands daily use. Endless Possibilities: With the Envoy case complementing your style, you will always look put-together. 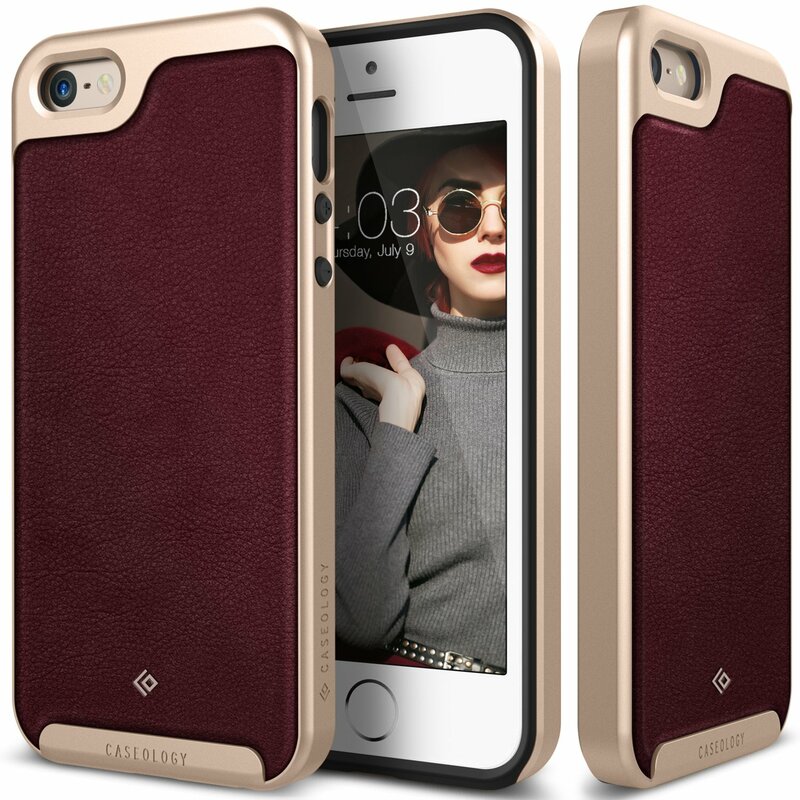 Color: Leather Cherry Oak Be classy every day Real cow leather in a selection of rich colors pairs with a matte gold bumper for ultimate class. The supple, slightly pebbled leather is smooth in the hand and a patented thermal fusion technique gives it a resilient unity with the TPU sleeve. Dual-layer TPU and polycarbonate provides thorough drop protection while textured leather and a soft feel coating on the bumper allow for a secure grip. The Study of Caseology In five years, we went from a startup selling plain rubber cases to a topAmazon seller with a wide selection of fashionable cases for Apple, Samsung,and LG phones. We make it a priority to listen to our customers and respond to their needs,so every new line of products is better, more durable, and more beautiful thanthe one before. The result? Each new collection is more popular, moresuccessful, and more beloved. Features Leather bonded to TPU with a patented thermal fusion technique Dual-layer protection thanks to shock-absorbent TPU and PC Spacious ports for easy access to all the phone's features A raised lip protects the touchscreen and camera against flat surfaces (does not include a screen protector) Due to image rendering and variation in screen color, actual color may differ from photo Don't Take Our Word For It _Over 3,500,000 Caseology cases have been sold, making Caseology one of thebestselling phone case brands, ever._ Everything You Need Look classy down to the tiniest detail.